ABIDJAN, Côte d’Ivoire – This review of the cocoa market situation reports on the prices of the nearby futures contracts listed on ICE Europe (London) and U.S. (New York) during the month of February 2019. It aims to highlight key insights on expected market developments and the effect of the exchange rates on cocoa prices. Chart I shows the development of the futures prices on the London and New York markets at the London closing time. Both prices are expressed in US dollars. The London market is pricing at par African origins, whereas New York prices at par Southeast Asian origins. Hence, under the same conditions, one would expect the futures prices in London to be higher than in New York. Nevertheless, in May 2017, changes in the grading rules for ICE Europe led to a substantial increase in both the share of Bulk Delivery Units (BDUs), which are more expensive to grade/re-grade, and cocoa beans of less sought origin. While continuing to monitor the effect of the change in the grading rule in the London market, signs of the return to normal market configuration started to appear during the last trading week of the month being reviewed. This partly resulted from data showing that, during February, among the seven Cameroonian Original BDUs (7,000 tonnes) submitted for grading, two (2,000 tonnes) failed. Chart II depicts the change in the ICCO daily price index and the US dollar index in February. By comparing these two developments, one can extricate the impact of the US dollar exchange rate on the development of the US dollar-denominated ICCO daily price index. 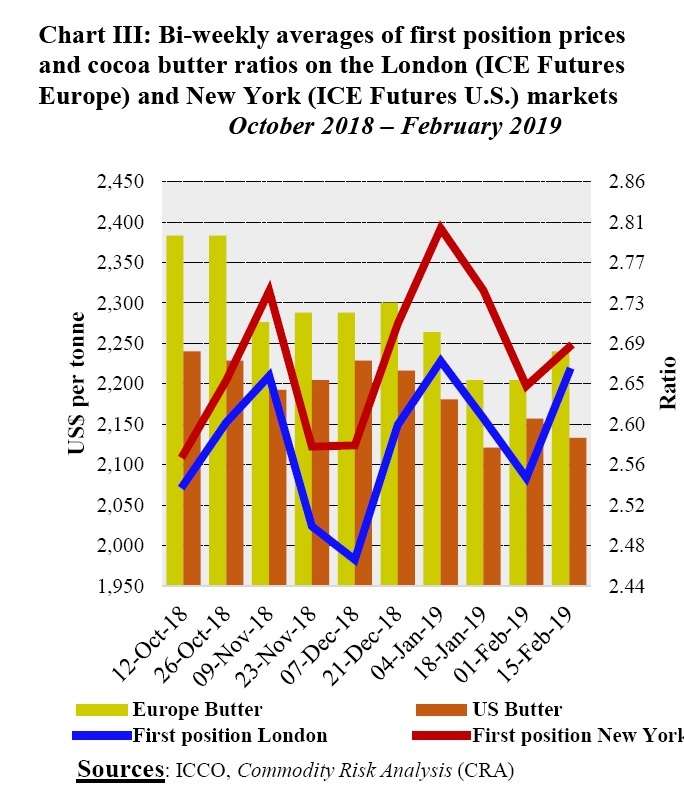 Finally, Chart III illustrates bi-weekly averages of the first position prices and cocoa butter ratios on the London (ICE Futures Europe) and New York (ICE Futures U.S.) markets since the beginning of the 2018/19 cocoa year. 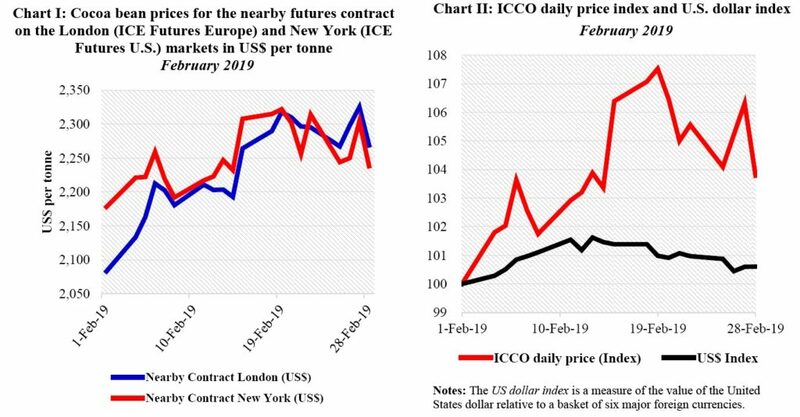 During February, the nearby cocoa contract prices perked up on both the London and New York markets as seen in Chart I. This upward trend was in reaction to prospects of an increasing demand coupled with adverse weather conditions that occurred in some West African cocoa growing regions. Subsequently, compared to prices at the start of the month, futures prices rallied by 9% from US$2,083 to US$2,269 per tonne in London and by 3% from US$2,178 to US$2,238 per tonne in New York by the end of February. Over the period 1-19 February, concerns over the impact of above normal temperatures in West Africa led to a substantial hike in prices in both London and New York. In particular, the dry and hot climate conditions that prevailed in the main cocoa cultivating areas in Ghana led market participants and forecasters to consider a downward revision to their prediction for the 2018/19 crop size in the country. In addition, Harmattan winds in Nigeria’s main cocoa producing areas heightened the negative impact of unfavourable weather conditions on production. As a result, the nearby contract prices increased from US$2,083 per tonne to US$2,318 per tonne in London whereas in New York, they rose from US$2,178 per tonne to US$2,322 per tonne. However, it is worth noting that, this bullish stance did not continue and from 20 February onwards, projections suggesting that the top cocoa supplier was racing toward another record level in cocoa production resulted in a downward turn in prices. Thereafter, the front-month contract prices plummeted by 2% from US$2,310 per tonne to US$2,269 per tonne in London and by 3% from US$2,302 per tonne to US$2,238 per tonne in New York. Finally, the strengthening of the US dollar – by nearly 1% – during the month of February had a negligible impact on the soar observed in the US-denominated cocoa price (Chart II). As shown in Chart III, cocoa butter ratios have generally followed a downward trend in both Europe and the United States since the beginning of the 2018/19 cocoa year. During this period, cocoa butter ratios retreated by 4% from 2.80 to 2.68 in Europe and by 3% from 2.68 to 2.59 in the United States. On the other hand, compared to the level reached at the start of the crop year, the nearby contract firmed by 8% year-on-year in both London and the United States. Prices increased from US$2,028 per tonne to US$2,197 per tonne in London while they moved from US$2,071 per tonne to US$2,234 per tonne in the New York. It can be noted that cocoa butter ratios are inversely related to cocoa beans prices. With the 2018/19 main crop drawing to a close, arrivals data show that, Côte d’Ivoire is about to top its record cocoa production established during the 2016/17 crop year at 2.020 million tonnes. As at 10th March 2019, cumulative arrivals at Ivoirian ports were seen at 1.587 million tonnes, up from 1.441 million tonnes recorded during the same period last season. In Ghana, production is expected to remain stable despite a drought, as the country continues with the implementation of its Production Enhancement Programmes (PEP). Over the same timeframe, Nigeria’s output is expected to move downward by 10,000 tonnes to 245,000 tonnes. 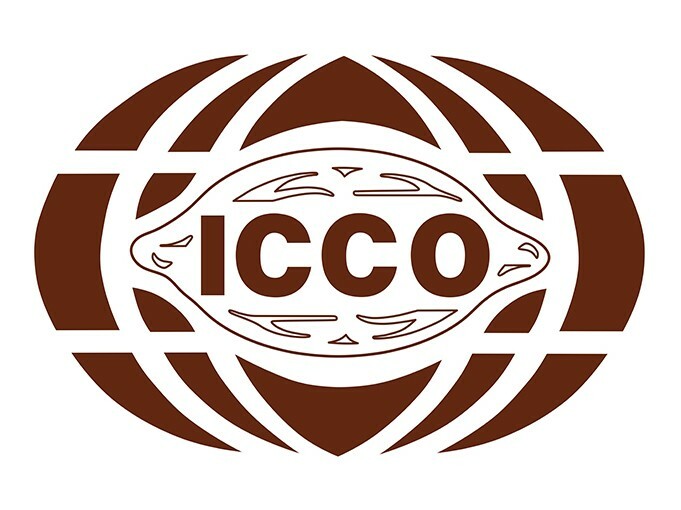 The first forecasts for the 2018/19 crop season published by the ICCO Secretariat in its latest issue of the Quarterly Bulletin of Cocoa Statistics reveal an anticipated increase in world cocoa grindings of 2.6% compared to the previous crop season. Grindings are expected to reach a record, settling at 4.712 million tonnes, up by 118,000 tonnes. This higher forecast reflects the unabated increase in demand which is mirrored by the steady growth in cocoa processing in origin countries as well as an increase in the demand for chocolates with high cocoa content.